Description: Coal loads roll down the main at Tryon siding in Charlotte. This train's shuttle engine is an ex BN LNG SD40-2, now in the Helm lease fleet. Description: looks like the baby got a litlte hot...nice scorth mark on the side. 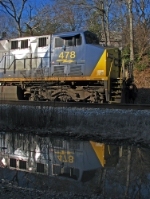 Description: CSXT 478, working as train M926 (extra Dothan roadswitcher), shoves a string of cars into the yard past the former ACL depot. Description: Q153 westbound at CP 313 with 132 axles. Description: Spirit of Brunswick at the head of 110 empties awaits a new crew.